Take a glimpse into the newlywed couple's spacious and stylish 5 Room HDB flat in Choa Chu Kang. 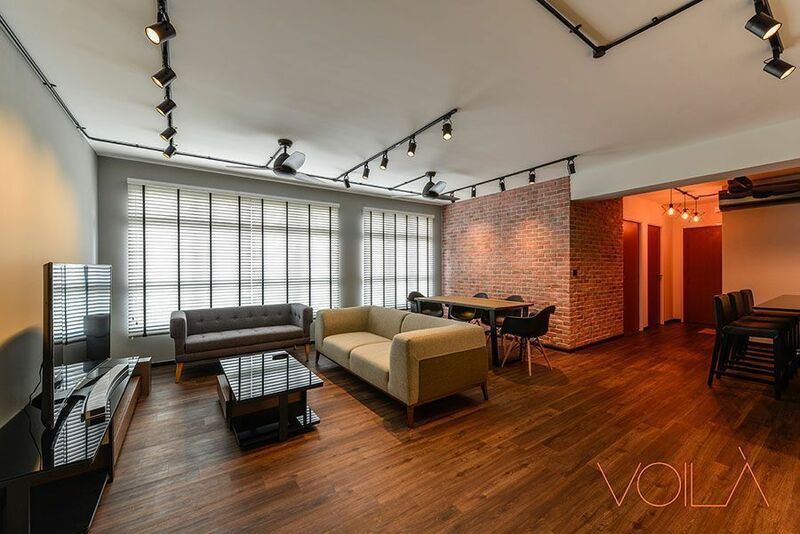 Space is a valuable commodity in Singapore, and newlywed couple Sohail and Masada are just too happy their 5 Room Balance HDB flat affords them that. Situated in a quiet and green neighbourhood in Choa Chu Kang, their corner flat is spacious and open kids will have a grand time running around it. Step inside their flat, and you will also notice how warm it is: red orange brick walls, wooden elements, and earthy tones that give you the cosy feel. The couple, who moved in immediately after their wedding almost two months ago, wanted a home that isn't "too modern," says Sohail. As they looked for interior designers online, they came across interior design company Voila. "We stumbled upon their FB advertisement and their works suited our looks. Something minimal, not too modern and glossy, not too shiny." Sohail and Masada met up with Voila interior designer Alan See, who was more than happy to help the couple realise their dream flat. "We went over their needs and their budget for the whole renovation. Luckily, they trusted me and finally they decided to engage Voila as their ID," says Alan. "I asked what their theme was, and then as the days went by, we shared ideas. We completed the whole house, and everyone was happy." Pre-renovation, Sohail and Masada wanted their home to be simple, warm, with minimal decor and furniture. Their living room exemplifies the look they were gunning for. There are no knickknacks on the surfaces and no hanging wall decors, keeping the living room airy and uncrowded. Neutral-toned sofas from Star Living and Comfort Design give the area an understatedly handsome look. "I like the living area where we can just watch the TV and chill," says Masada. The dining area gets a significant dose of industrial warmth from the track lights and red brick wall that goes all the way to the hallway. "I think the only challenge during the renovation was the brick wall. We had a hard time deciding what kind of brick and what colour [would fit the house]," says Alan. "In the end, we finalised our decision and ended up with something the couple wanted." Sohail is happy to report that the dining set can sit seven to eight people—perfect for visiting family and friends. "We got a dining bench as it could sit four people, plus it doesn't block the view of the TV," Sohail says. Dining furniture pieces were sourced from Mondi and Star Living. The flat's open concept layout covers the kitchen, which is one of the flat's most prized features with its granite-covered surfaces, black subway tiles ("We saw smaller and white tiles, they don’t stand out a lot," says Sohail), and a massive kitchen island bar. "I like the fact that our flat is pretty open. Especially for HDB flats nowadays they’re pretty small...we were happy about the fact that we got to hack down the kitchen wall. I like the open concept so you wouldn't feel lonely in the kitchen, you wouldn’t get stuck alone dishes. It feels great to have your guests even in the kitchen," says Masada. Alan points out that a lot of work went into hacking the kitchen wall to make the area more open—and obviously it's worth it. The extra space even allowed the installation of this granite island bar. "Friends love hanging out at the island," says Sohail. The couple sourced their track lights and pendant lamps from a wholesaler. "Our lights were DIY. We designed them ourselves. We wanted to see how many we could put—we wanted to put as many as possible," Sohail says. The study room was kept simple and minimalist. "The bedroom is minimalist. We just installed a wardrobe. The look is very simple," says Alan. The couple are also fond of their neighbourhood. "We’re loving the area. We love the view: it's all green like a jungle. Sometimes we're like, 'Are we really in Singapore?'" Sohail says. "Our friends are looking forward to bring the kids here because they can freely run around," says Masada. "The whole house, I’m just happy with it. It’s very comfortable and relaxed." 1. Never rush. "I think we spent twice the time talking to the ID than the actual renovation. It took us five to six just choosing [materials, designs], five to six weeks discussing what colour of the cabinets we wanted, the floor, the wall colour. Renovation only took four weeks. Don’t rush. Make sure you’re happy," says Sohail. 2. Know what you want. "You need some ideas about what you want, what kind of feel you want for your home before approaching your ID," advises Masada. 3. Never compromise on the quality. Sohail explains, "Don’t compromise on the quality. For example, we wanted something else for the flooring, but we ended up with vinyl flooring which cost quite a lot. At the end of the day, we’re happy with the quality and the feel of this type of flooring." Cromly is proud to present this beautiful project for viewing on 30 and 31 July 2016, 11am to 1pm. Contact Alan See at 91132210 or visit the Facebook Event page to RSVP.